Being part of a high profile gambling organisation you can gamble with security. If you like the Paddy Power brand and excellent customer service they are a great choice. They also offer a huge range of games with featuring most games offered by three of the biggest online gambling software providers. Cons – Some people will prefer a Microgaming Casino and others may be a little overwhelmed by the choice and variety on offer. Others may prefer better sign up bonuses that are out there. 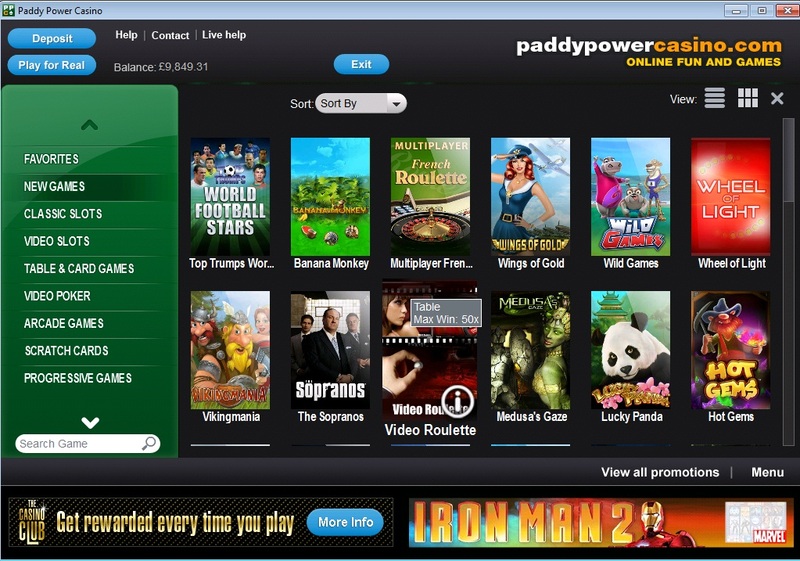 Paddy Power’s casino offering runs on Playtech software and is backed by Ireland’s online gambling giant. They are licensed in Alderney, just off the coast of the UK and are one of the most reputable online gaming organisations on the market. Paddy Power’s casino operations have gone through some changes over the last few years and this means that if you are browsing other online reviews you may get confused or mislead as to exactly what games they offer and what software they use. 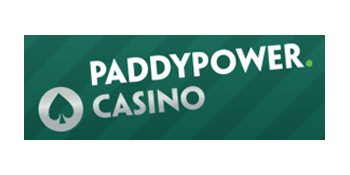 Paddy Power are a major gambling brand that is probably best known for its sports betting but also offers casino games, poker, lotteries and bingo. Their Casino games are split into five different areas Live Casino, Player, Games, Casino and Mobile Casino. Even whilst writing this review their casino offering was undergoing changes that meant I had to rewrite certain elements of this review after the initial draft before it was reviewed to go live. With Paddy Power Casino you get one big brand, one wallet and access to some very different gambling experiences with one deposit. Paddy Power is definitely a brand you can trust and they do value their customers and provide great customer service. They offer live chat which is a huge plus and this is something that many casinos fail to offer. When using live chat I did think it took them a little while to respond to my queries but this is just me being spoiled by some of the very best live chat supports I have encountered and I would still class their customer service as excellent with few sites able to compete or better their support. Their “Casino” section can be played as a download or Flash casino and is an excellent casino in and of itself. It uses Playtech software which is one of the best gambling software providers out there. You can play about 300 different games and there is plenty variety and choice on this platform. Where Paddy Power is particularly strong is in Progressive Jackpots with over 30 of them, more than many casinos including those using Playtech software are able to offer and they will pay your winnings in a lump sum which many casinos . I do prefer some of the other software providers but do feel that Playtech offers a first rate experience and every game they have represents a combination of innovation, easy to use and classy interfaces and overall provides a first class gaming experience. With Playtech I usually recommend that people download the software as this provides a higher quality gaming experience but this might lead players to forget that Paddy Power also offer many other casino gambling possibilities. I know of many gamblers who will only play on Microgaming casinos such as 32Red Casino but these players are missing out on the variety that Playtech offers. This is perhaps most evident in the slot games where they have a wide range of vary enjoyable slot games that are different enough from what other platforms offer that they definitely are worth checking out. They also offer great odds that whilst are generally not quite as good as Microgaming are still very competitive. Their “Games” section offers a variety of games from other software providers as a no-download casino with IGT games and Cryptologic games featuring prominently but also offering games from other suppliers including GETECH G2, Barcrest and Cayetano Gaming. The “Games” casino offers 300 games in total of which 190 are slots. These games include some of the very best online slots games that are out there and I particularly like Bejewelled, Street Fighter II and Star Trek: Against All Odds. Being a curmudgeon I would have perhaps liked some of Microgamings best games to be here but there are plenty other sites I can go to when wanting a MG or NetEnt fix. The “Player” section enables you to pit your wits against other human players in a range of skill games including head to head blackjack, backgammon and Gin Rummy. Their Player section is very much a work in progress as the success of a platform of this sort is very much around how many people are interested in engaging with it. If you take Poker Stars, it is able to offer the maximum variety in gaming experience whenever you want it because it has such a huge player base. As a competitive person who is always looking for advantages in my gambling the player section I will be participating in and watching this section with interest to see how it catches on with other players. It is certainly a great addition to the site. They also offer instant games where you can gamble with skill elements including a version of Championship Manager. I am wary of providing any review of mobile casinos as this is an area in which many casinos are rapidly developing and changing their offering and it feels very much an evolving area of online gaming. Currently most providers are only offering a limited number of games in mobile versions. Paddy Power are also following the trend to offer a live casino and they have a meet the dealers section which is a nice touch. Paddy Power Casino also enables you to play online poker through the iPoker network which offers a good range of games and very decent online poker platform to play with. In other reviews I have highlighted that when it comes to poker I tend to stick with Poker Stars but people may enjoy the community elements and added “juice” that can come with smaller platforms when the “house” needs to top up buy ins to meet prize guarantees. Paddy Power also offers live casino, bingo, live betting and sports betting. Bonuses change all the time but at time of writing Paddy Power offers fair but not exactly generous bonus terms. They offer up to £200 in sign up bonuses but with £100 for the first deposit with a 32 deposit plus bonus playthrough requirement and many games either excluded or not counting significantly towards meeting playthorugh requirements. Ultimately a great casino with a great reputation and other gambling ventures does not need to offer as much to get people to choose them. On the plus side they do explain the bonus terms clearly and you need to opt in to a bonus so you are unlikely to get into any mix up around their bonus offering. They do offer some specific bonuses for their live casino at times and these are worth checking out. Paddy Power casino offers such amazing breadth it is easy to feel a little overwhelmed by the variety of games that they offer but their grouping of casino gaming into Player, Casino and Games does enable you to view the casino and the variety of their gaming experiences in manageable chunks. One of the greatest advantages of Paddy Power is that all the casino gambling options come under one gambling wallet which means you can easily hop from one game to another without any hassle or bonus restrictions. On one site you get to experience the best of Playtech, IGT and other software platforms in one site without any need to download. For people new to online gambling they may prefer the “greatest” hits type approach of game selection such as those Bet365 and Virgin Games offer and they do miss out on some great games other software providers offer but this remains one of the very best places to play online offering excellent customer service, piece of mind and one of the greatest choices of games available online. Many players will enjoy other opportunities that Paddy Power offers with live casino, bingo, poker and betting. Those looking for the best bonuses may go elsewhere but those wanting a great playing experience with superb customer service will keep coming back.